The first study on the fungus that is attacking the Elm population was first carried out in Holland, which is where the disease gets its name. It was at this time scientists discovered that this aggressively spreading fungal problem will be a very difficult issue to resolve. 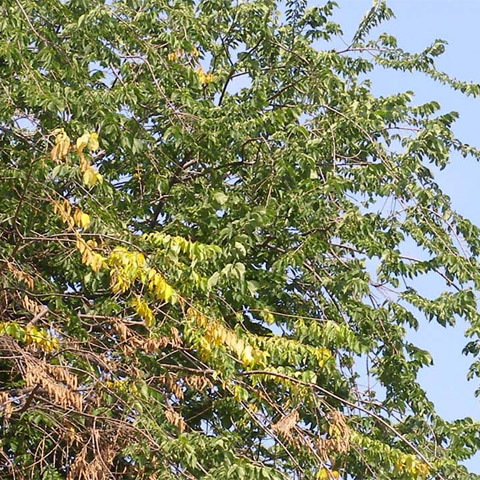 Dutch Elm disease generally is first noticed at the top of the tree canopy. This is because the Bark Beetles prefer the feed on the new tissue, which is found in the upper portion of the leaves and branches. From here the symptoms move their way down the trunk and limbs using the vascular system to spread the disease. The issue can also be passed along through grafted roots in the ground, and it’s how healthy trees may also develop this debilitating problem. The tree notices the fungus is attacking and it tries to defend itself by closing down its vascular system. This vascular clogging eventually affects the whole tree as the fungus spreads. The tree ultimately kills itself due to lack of water and nutrients. What do the Beetles Do? The bark beetles are not actually harmful to the tree. Only beetles with the fungal spores attached to them will be harmful. These beetles use that tree’s bark as a place to lay their eggs, and the larvae feed on the wood below the bark. The spores found on these new beetles will be passed along to other Elm’s as they move to different locations. The beetles specifically like the trees with thick bark and that are at least 15 feet or taller. This means that young trees will be relatively safe until they reach maturity. This problem has been around for a long time and is nearly impossible to contain. The best practice is to have an arborist come at the first signs of a possible infection and have them do and assessment of your tree. Early prevention could mean that the arborists might be able to prune away the affected branches, and if not they can help develop a course of action.